This diagnosis detects very small leaks in the EVAP line between fuel tank and EVAP canister purge volume control solenoid valve, using the intake manifold vacuum in the same way as conventional EVAP small leak diagnosis. If ECM judges a leak which corresponds to a very small leak, the very small leak P0456 will be detected. If ECM judges a leak equivalent to a small leak, EVAP small leak P0442 will be detected. If ECM judges there are no leaks, the diagnosis will be OK. NOTE: • If DTC P0456 is displayed with P0442, first perform trouble diagnosis for DTC P0456. • After repair, make sure that the hoses and clips are installed properly. • Make sure that EVAP hoses are connected to EVAP canister purge volume control solenoid valve properly. TESTING CONDITION: • Open engine hood before conducting following procedure. • If any of following conditions are met just before the DTC CONFIRMATION PROCEDURE, leave the vehicle for more than 1 hour. - Fuel filler cap is removed. - Fuel is refilled or drained. - EVAP component parts is/are removed. • Before performing the following procedure, confirm that battery voltage is more than 11V at idle. 2. Make sure the following conditions are met. FUEL LEVEL SE: 0.25 - 1.4V COOLAN TEMP/S: 0 - 32°C (32 - 90°F) FUEL T/TMP SE: 0 - 35°C (32 - 95°F) INT A/TEMP SE: More than 0°C (32°F) If NG, turn ignition switch OFF and leave the vehicle in a cool place (soak the vehicle) or refilling/draining fuel until the output voltage condition of the “FUEL LEVEL SE” meets within the range above and leave the vehicle for more than 1 hour. Then start from step 1). 5. 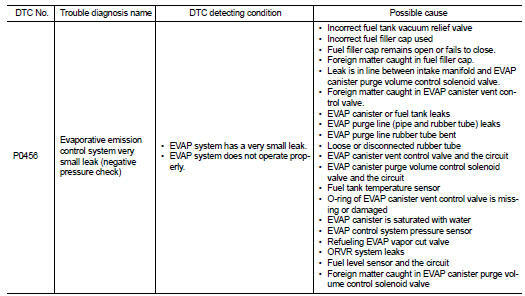 Select “EVAP V/S LEAK P0456/P1456” of “EVAPORATIVE SYSTEM” in “DTC WORK SUPPORT” mode with CONSULT-III. NOTE: If the engine speed cannot be maintained within the range displayed on CONSULT-III screen, go to EC-24, "BASIC INSPECTION : Special Repair Requirement". NG >> Go to EC-338, "Diagnosis Procedure". Perform component function check. Refer to EC-338, "Component Function Check". NOTE: Use component function check to check the overall function of the EVAP very small leak function. During this check, a 1st trip DTC might not be confirmed. NO >> Go to EC-338, "Diagnosis Procedure". CAUTION: • Do not use compressed air, doing so may damage the EVAP system. • Do not start engine. • Do not exceeded 4.12 kPa (0.042 kg/cm2, 0.6 psi). 1. Attach the EVAP service port adapter [commercial service tool: (J-41413-OBD)] securely to the EVAP service port. 2. Set the pressure pump and a hose. 3. Also set a vacuum gauge via 3-way connector and a hose. 5. Connect GST and select Service $08. 6. Using Service $08 control the EVAP canister vent control valve (close). 7. Apply pressure and make sure the following conditions are satisfied. Pressure to be applied: 2.7 kPa (0.028 kg/cm2, 0.39 psi) Time to be waited after the pressure drawn in to the EVAP system and the pressure to be dropped: 60 seconds and the pressure should not be dropped more than 0.4 kPa (0.004 kg/cm2, 0.06 psi). 4. Restart engine and let it idle for 90 seconds. 5. Keep engine speed at 2,000 rpm for 30 seconds. 6. Turn ignition switch OFF. NOTE: For more information, refer to GST Instruction Manual. Refer to EC-341, "Component Inspection". 2. Check if water will drain from the EVAP canister. Does water drain from EVAP canister? YES >> GO TO 8. Refer to EC-302, "Diagnosis Procedure". Refer to EC-318, "Component Inspection".